I have own modded cars since i got on island 8 years ago, and I have never had any problems, they dont check for emmisions and they aint gonna go down and inspect your engine bay (thats my experienced so far). you shouldnt have any problems passin safety inspection if "thats your only Mod in the car". thanks for the input, im assuming recon dosent pass a catless d/p if i wanted to go and get one? I have a question, I'm currently in NE and will be shipping my car to HI in about a year when I move back (I am born and raised on oahu). Am I going to have to go through a bunch of out of state registration/inspection stuff since the car is plated in NE? I want to get a full exhaust system and remove cats if possible but definitely don't want to go through recon. 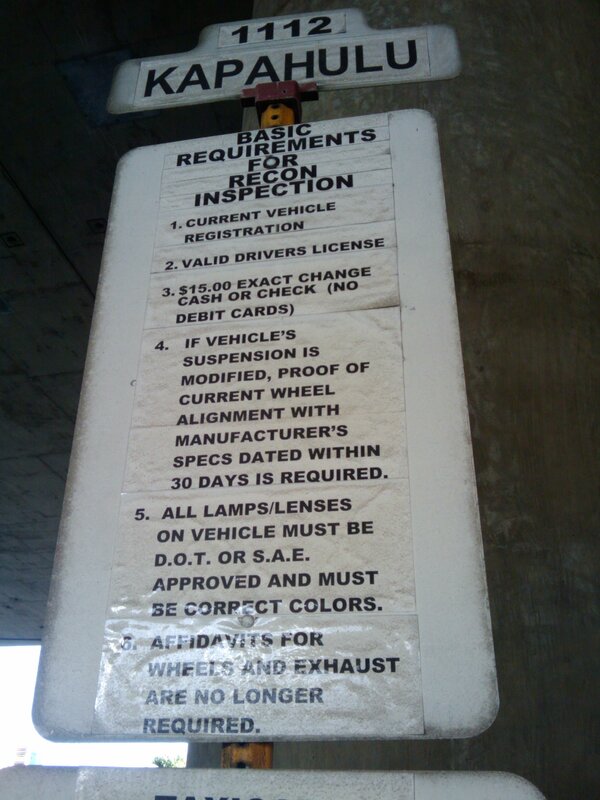 Also does HI do smog test? Just a reminder for everyone else: if you have any questions, try calling Recon and talk to one of the tech's -- most of them are more than willing to help out! hey guys, got a quick question. i know my car is gonna have to go to recon, but what would they say about my RHD? if you have a dashcover, make sure you either cut out the area that covers your VIN or take it off. I was lucky and the inspector let me take it off. I need to renew my safety check, so Ill need recon to get er done,..
Can anyone pm me with info since I have exhaust questions that I'd rather not post up..
Last edited by abakja1; 05-02-2011 at 04:39 PM. The suspension test consists of pushing down on the body of the car "with little effort" on all 4 corners with the goal being that the car goes down an inch and rebounds back up. Now, the problem (talking with the inspector) is that WRX/STI suspension is very stiff, even stock. WRX/STI suspension generally wouldn't pass inspection stock if they had to inspect it, he said. So: if you have adjustable tension, make it AS SOFT AS POSSIBLE (to the max) before you get inspected. I have KSport Kontrol Pro coilovers (8.7/487 front 5.1/286 rear) and I lucked out that the inspectors let me adjust mine to max soft tension for all 4 struts--and even then they had one of the supervisor guys come out to inspect before they passed me. wow, that sounds sketchy - i know mine takes some effort to get it to one inch of give... they should probably specify how much effort (in #'s)...but they wont. Howz it! Just go on island back in May. Quick question about RECON, I got an 05 STI with blacked out headlights, exhaust and lowered on springs. My safety inspection expires this month. I bought the car from the dealer exactly the way it is minus the blacked out headlight. Would I be looking at getting a RECON? Thanks in advance! Best bet is just try the safety. They will say if you need it. Then go get the recon. Thats how my buddy did with his truck. 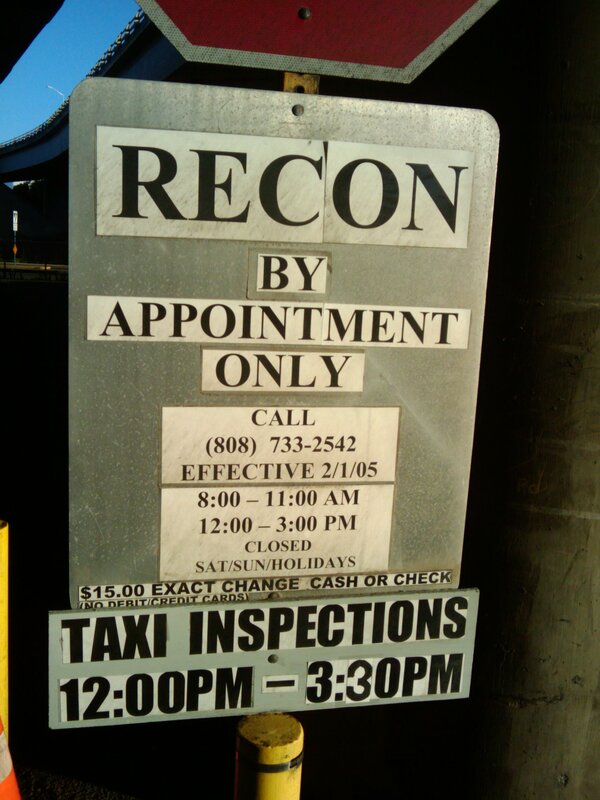 Start now before safety expires because your going to have to schedule recon if you need it. As far as the headlights as long as they still have the reflectors.